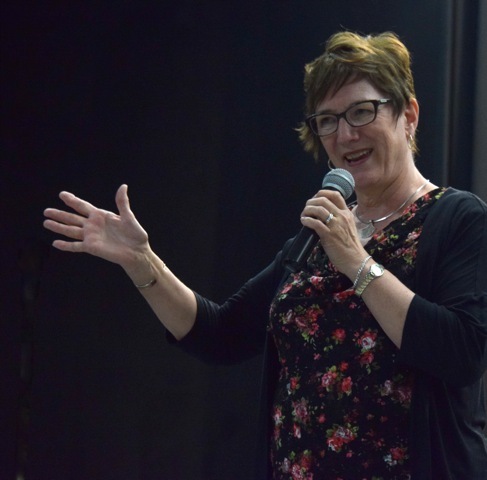 Mary Hays is teaching and performing all over the province of Alberta, and across Canada. 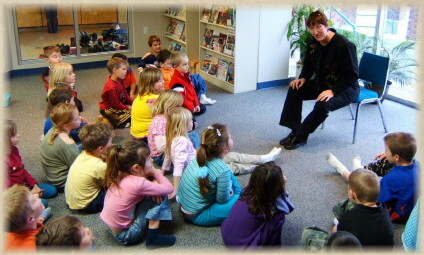 She taught storytelling at SAIT Polytechnique, Library Information Technology Program for 20 years. She trained 300 storytellers through that program! She wants to bring the wealth of her experience to you and your group! 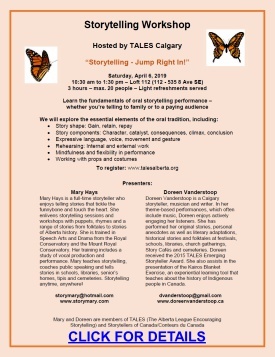 Call Mary at 403-556-5831 to talk about creating a storytelling training program for your group or work place. Private coaching can be individualize to meet your needs. In 2019, to celebrate the 90th anniversary of the success of The Persons Case, Mary joins five storytellers in a 50-minute presentation where each will perform as one of the Famous Five. 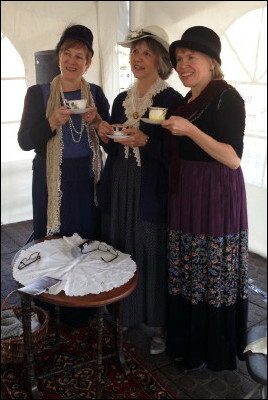 Betty Hersberger as Henrietta Muir Edwards; Donna Barnfield as Nellie McClung; Mary Hays as Louise McKinney; Karen Gummo as Irene Parlby; Doreen Vanderstoop as Emily Ferguson Murphy. If your organization is interested in booking The Valiant Five performance, please contact Contact Mary for your own performance. My storytelling journey with Louis Soop. STORYTELLING - JUMP RIGHT IN! Print our poster & share with your friends. Refreshments served. $40/adult $30/children. Register online at www.talesalberta.org. Host: Mindy Woolcott. Mary will tell the story of a Trucker's Reflections. 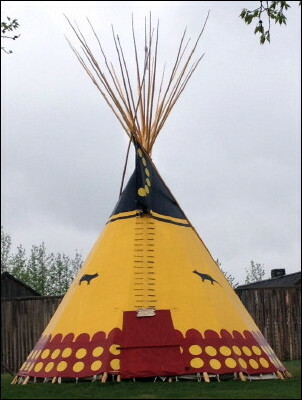 Info at www.talesalberta.org. 5 storytellers: Betty Hersberger, Donna Barnfield, Mary Hays, Karen Gummo, and Doreen Vanderstoop present the story of The Famous Five and The Person's Case. During Historic Calgary Week, 5 storytellers: Betty Hersberger, Donna Barnfield, Mary Hays, Karen Gummo, and Doreen Vanderstoop present the story of The Famous Five and The Person's Case. Historic cemetery tours featuring stories of our early settlers. Sponsored by the Town of Olds and Alberta Historical Resources. Celebration of 90th Anniversary of The Person's Case with musician Caroline Harley and the Valiant Five Storytellers: Betty Hersberger, Donna Barnfield, Mary Hays, Karen Gummo, and Doreen Vanderstoop. Book now for a presentation with Mary and Doreen Vanderstoop, "We Remember - More Than Remembrance Day". True family stories about real people that illuminate history of WWII. For all ages. Mary and Betty Hersberger perform for school groups, families and seniors, "Stories from Around the World" - to touch the heart and tickle the funny bone. Call Mary at 403-556-5831 for details. Mary studied the Blackfoot stories for many years with her mentor, Louis Soop - Black Plume. She tells the story of creation and the story of the Sundance which provide the foundation for Naapi, the Trickster and his stories that teach lessons for all of creation. Louis passed away in March of 2018. He made his journey to the "sky country" with friends and loved ones near, and the fragrance of sage in the air. Mary is currently performing with other Alberta storytellers in a travelling performance, "Wise and Wilful Women". This story gives voice to Lady Isabella Lougheed, Mary Scott Widner, and Nellie McClung, three historical characters dedicated to social justice. Storytelling Cafes are held at 7 pm at Shelf Life Books, #100, 1302 - 4 Street SW, Calgary. Suggested donation: $10.00. Everyone welcome.